India's biggest oil explorer, Oil and Natural Gas Corporation (ONGC), has agreed a deal to buy a 10% stake in an offshore gas field in Mozambique. It will pay Anadarko Petroleum, a US firm, $2.6bn (�1.7bn) for the stake. The state-controlled firm has been keen to secure supplies in an attempt to meet growing domestic demand for fuel. 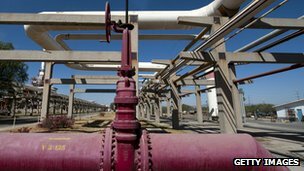 It said the field in Mozambique was "strategically located" to supply liquefied natural gas (LNG) to India at a "competitive price". Sudhir Vasudeva, chairman of ONGC Videsh Limited (OVL), the firm's unit which has agreed the deal, said the gas field had the "potential to become one of the world's largest LNG projects". He added that the deal was a significant step "towards the energy security of our country". India, Asia's third-largest economy, relies heavily on imports to meet the domestic fuel demand. The country has the world's second-largest population. As its economy continues to grow, demand for fuel is expected to rise further in the coming years. As a result, firms such as ONGC have been looking to acquire overseas assets in an attempt to secure long-term supplies. This is the second such deal signed by the firm in recent months. In June, along with Oil India, it agreed to buy 10% stake in the the Rovuma Area 1 field in Mozambique from the Videocon Group for $2.48bn. Last year, ONGC inked a deal to buy ConocoPhillips's 8.4% stake in Kazakhstan's Kashagan project for $5bn - its biggest overseas acquisition.